Recently Whitney Eiden, Co-Coordinator of the Youth Leadership Omaha program, shared insights on this unique youth development program and the tremendous work that Class 24 has made possible through their giving circle. For those unfamiliar with the program, can you give a brief overview of the goals and focus areas of the Youth Leadership Omaha program? 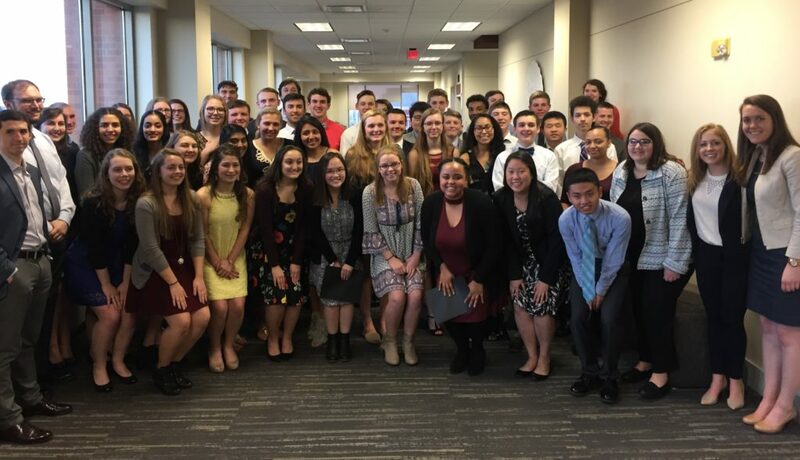 Youth Leadership Omaha aims to instill leadership techniques and community connection in our local students. The program teaches leadership and community involvement to two different groups of students: high school sophomores, who participate in the program, and Creighton University juniors and seniors, who lead the seminars. Our seminars focus on five different topics: Omaha Growth and Development, Health and Human Services, Justice and Government, Media and Arts, and Business, Technology, and Education. We devote one day to each topic and spend the day visiting various organizations within the community that aligns with each area. We find that we often introduce students to a whole new side of Omaha—one that they’ve never experienced before. Why do you feel it is important for youth participants to gain exposure to the nonprofit sector and learn about the philanthropic process? Our students have the power to make a positive impact on our community and it is important to support that. It’s our responsibility and privilege to show these students all the areas in which they can make a difference and teach them about giving. That is why we work with a variety of organizations, some nonprofit and some for-profit. Each organization we work with brings something unique to the table. In watching the class decide how and where to invest charitable dollars, what have been some of the key lessons learned for participants? So many of our students do not have the financial resources to give. Empowering them to direct the giving circle funds was an incredible gift. Having money to donate is a major responsibility and one that our students did not take lightly. They learned to ask thoughtful, challenging questions about the money and think about who really needed it the most. No matter how the money would be spent, the students realized that leadership and philanthropy came in many different shapes and styles. What we hope they took away is that to make a difference, they simply need to have a passion for the cause. No one can do everything, but everyone can do something. During this first year of the giving circle, what organization was supported? The students chose to award their $1,000 grant to the Open Door Mission. Most of our students were stunned to learn that the average age of a guest is nine years old. So many of our students were blind to the homeless population in Omaha. Hearing the ages affected, seeing the food distributed, and learning about the massive resources needed to care for these community members—all of it was so eye-opening for our students. It’s been amazing to watch the group realize that some of the basic things they take for granted are not guaranteed for other people. What have you found most valuable in working with the Omaha Community Foundation? It has been wonderful to show our students one of life’s most valuable lessons: no matter what you do for a career, you need to love it. It is evident that the people at OCF love their work and love Omaha. If our students can see that passion for giving and helping in others, it is perhaps one of the best lessons we can share. Celebrating 5 Years of Omaha Gives!